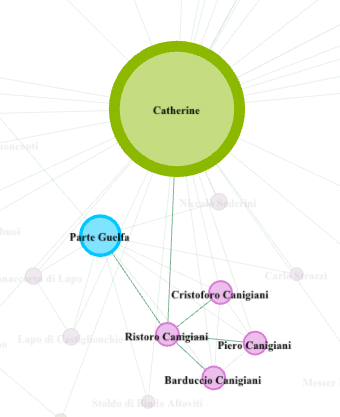 Barduccio’s Caningiani brother and follower of Catherine. He belonged to the Guelf party in Florence, Italy where he participated as a leader of the party and a learned lawyer. He fought back against the Pope during the Florentine interdict in 1377. A year later Catherine wrote Ristoro five letters detailing her advice to him, Suzanne Noffke wrote that Ristoro Canigiani, “was among those whose houses were looted and burned on or shortly after 22 June 1378, during the uprising of the Ciompi.”1 Catherine’s relationship to the Canigiani family gave her a connection to the inner politics of Florence during a trying time.